Mangoes are grown in tropical climates. In the U.S., mangoes can be found in the grocery store throughout the year because shipments come in from a number of different countries in South America and the Caribbean, according to the National Mango Board. A 1-cup serving of mango contains about 100 calories and some vitamin C, calcium, vitamin E and vitamin A.
Vitamin C is an essential vitamin for humans, according to the Office of Dietary Supplements. It is a water-soluble vitamin and must be consumed regularly because it is not stored in the body. Vitamin C is needed for normal growth and development and for the synthesis of collagen, a protein found in skin, tendons and ligaments. Vitamin C is also an important antioxidant protecting cells from free radical damage. As an antioxidant, vitamin C may help protect against cardiovascular disease and cancer, according to the Office of Dietary Supplements. Adult men need 90 mg of vitamin C a day and adult women need 75 mg. A 1-cup serving of mango provides 45 mg.
Mangoes also contain folate, or vitamin B-9. This vitamin plays an important role in helping your body produce proteins and DNA -- the building blocks of newborn cells. For this reason, getting enough folate is especially important for expectant mothers, because they need to meet the needs of the developing baby's rapidly-dividing cells. 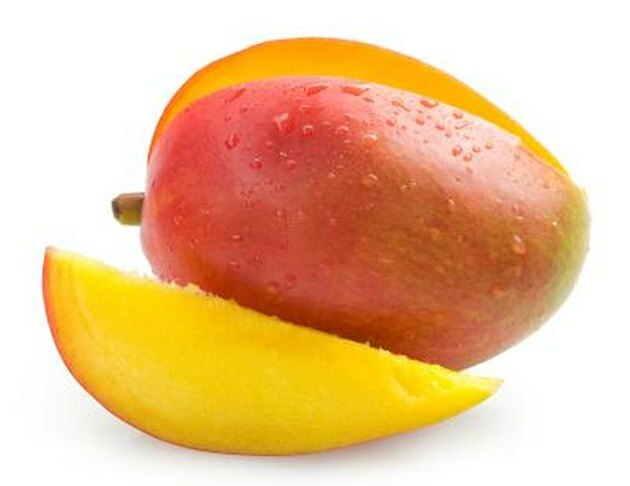 A cup of mango provides 71 micrograms of folate, or 18 percent of the folate you need each day. Vitamin E is a fat-soluble vitamin. It helps immune function and is an important antioxidant. Most Americans do not get enough vitamin E in their diet, according to the Office of Dietary Supplements. Adults need 15 mg of vitamin E a day. A 1-cup serving of mango provides 1.85 mg.
Vitamin A is important for vision, bone growth and reproduction. It also plays a role in cell division and differentiation, according to the Office of Dietary Supplements. Vitamin A deficiencies are rarely seen in the United States, but poor vitamin A intakes can lead to night blindness and a decreased ability to fight infections. Mangoes are an excellent source of vitamin A, according to the National Mango Board. A 1-cup serving of mango provides 63 mcg RAE, or Retinol Active Equivalents accounting for the biologically active vitamin A as a retinol or a carotenoid. Adult men need 900 mcg RAE of vitamin A per day and adult women need 700 mcg RAE.